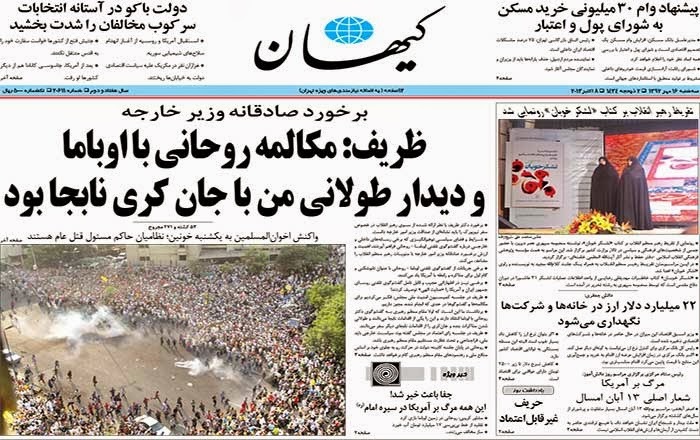 Following is the English translation of key paragraphs of Kayhan’s article, which appeared on the front and the third pages of today’s edition of the paper. “In Sunday’s meeting of the national security and foreign policy committee of the Majlis, which had been called to examine the talks (with Obama and Kerry) and other actions by the Iranian delegation during the New York visit, the committee chairman asked Dr Zarif about actions that the Supreme Leader had characterized as missteps. It is most depressing that our supreme leader and his cronies so blatantly, and if I may say arrogantly, ignore the wishes of ordinary Iranians expressed through ballot boxes. Since when did Iranians expressed their wishes through the ballot box to establish ties with the US, whom by the way, is murdering Iranians day and night with the evil sanctions? you are a no reader but a self worshiping mortal! tottaly refusing to read the reality on the genaral Iran /US relations!-but because you have some wisdom in you -try this one! President Obama shows some willingness to meet President Rouhani face to face !-some sharks in the corridors of power in the US Government place some obstacles thereby killing the dream of Obama and leaves the US public GUESSING!. @-it is amazing that the LEADER depresses you! why not the US President! and his team-they show willingness to court the new Government in Iran,show some genuine sign to break new ground-only for OBAMA to release a salvo of hot air that "Iran has a year to make the bomb! -have a depress less day!! If Iranian people wanted the status quo they would have voted for Jalili, instead they voted for a level-headed moderate, ignoring the so called “sources of emulation”. This “self worshiping mortal” has difficulty understanding your argument. It would have helped if you could have structured your thoughts in a way that a mere mortal like me could comprehend. However I get the gist of your argument – there are sharks and cronies on both sides? I could not agree more - we all know the sharks on the other pond, but who are the sharks in our pond? More Iranians are being "murdered" by the theocratic thugs on a daily bases than any sanctions from the west.And don't even go there as regards medical supplies to the country because there is no sanctions on those.The regime has confirmed that most medical supplies are being held in warehouses to max profits for the anti-Iranian regime.